THE WRITING BUDDHA - Opinions | Books | Movies: Be Your Own Pilot by Manish Kumar (Book Review-3.9*/5)!!! Be Your Own Pilot by Manish Kumar (Book Review-3.9*/5)!!! For a long time I have seen the updates related to this book named "Be Your Own Pilot" but I always thought that it would be kind of repetitive autobiographical incidents in the life of a man related to army or navy as the book is written by Retired Sqn. Leader Manish Kumar. I always thought that its a pure fiction story based on his own life but after reading this book which is based on the lines of Robin Sharma's The Monk who sold his Ferrari, I can say that it's a book which you should definitely read if you love reading self-help and motivational books. With the simplicity and spirit in which it's written, it makes your journey of reading even more inspiring and eye-opening. Manish Kumar ensures that each and every word that he wants to convey reaches exactly in the same meaning to his readers. Therefore, the language used by him is very easy even when he tries to make us understand the nuances of flying a plane. I liked how he successfully related our lives with that of riding a plane. He tries to teach us basic rules which can make us better, confident, successful, leader and happy by describing how he grew into a leader from a learner in just 12 years. Manish Kumar should write more such books and assure that there is enough motivation in our youths. Not many Indian writers manage to write a book which is motivational but still interesting. Manish Kumar have definitely won his seat here. 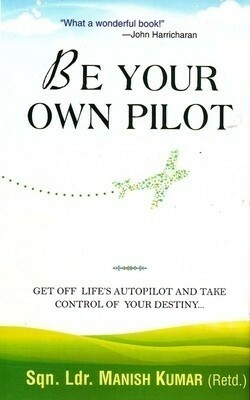 Be Your Own Pilot teaches us about how to not let ourself ruled by heavy challenges and impossible situations. It tells us that it's in our hand how we want to ride our life by using our common sense, intuition, sixth sense, by valuing time and being humble. It tells us to possess many such traits which we do not in ego and overconfidence. I liked how author began his story and tells about the insult he has to undergo because of which he even decides to quit the job of pilot. Later on, I liked how he takes us in back story where he tells how he got committed to a girl and even managed to go at our home to ask for her hand from her father. But I am disappointed as author didn't take the protagonist back to the girl for marriage. :-) Nevertheless, there's no difference in the quality reading that the book offers. Definitely, a light read but with heavy messages. Recommended!